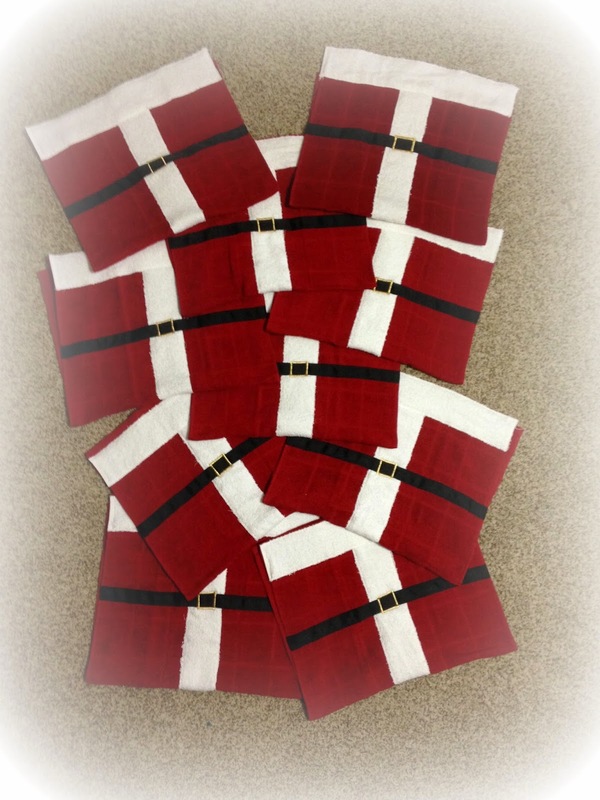 It looks like a Santa Belly Towel factory in The Queen's Studio today. I made 10 of these towels. They are so easy to make. I first showed you them on the Twas the Night Blog Hop. I also told you I'd do a tutorial on them and I finally got around to doing it. You really don't need one, I'm sure you can figure it out on your own; it's that easy. But I'll take the guess work out of it for you. Cut 2 strips of white terry cloth the width of the towel by 2 1/2". 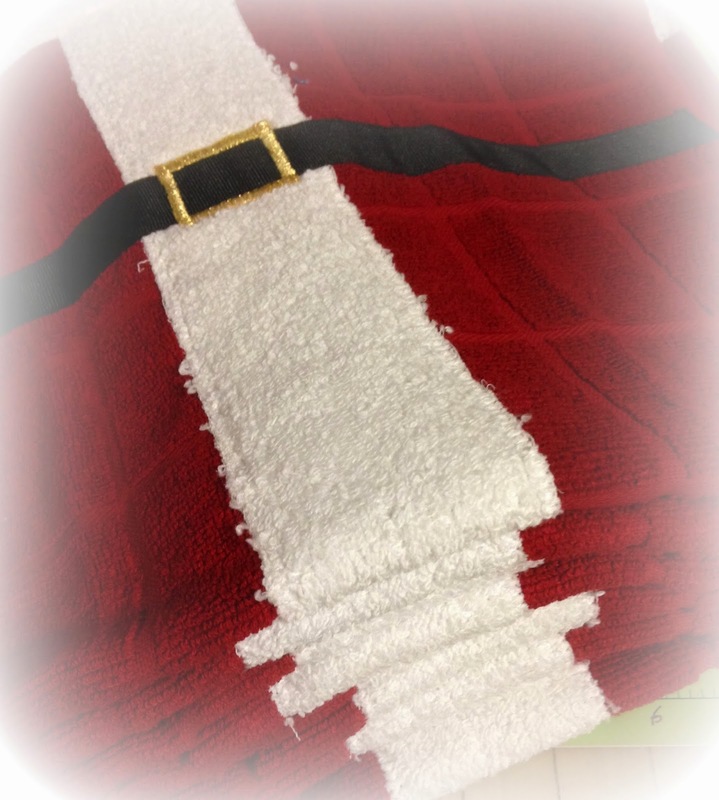 Lay one of the 2 1/2" white terry cloth strips down the length of the towel, centering it. I cut mine 23" but you will need to measure your towel to make sure that will work. I didn't measure anything on mine. I just eyeballed it but my towel had a grid woven into the towel so it was easy to use the grid as a guideline. I didn't go all the way to the bottom of the towel, I stopped short of the edge of the bottom of the towel by 2". 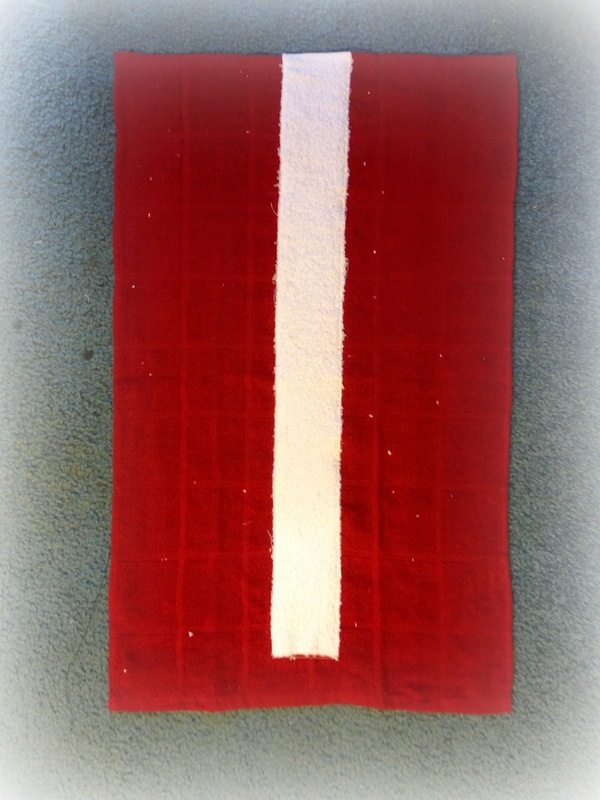 Using a zigzag or a button hole applique stitch, applique the strip to the towel. Then cut a strip 2 1/2" by the width of the towel and place along the bottom edge of the towel. 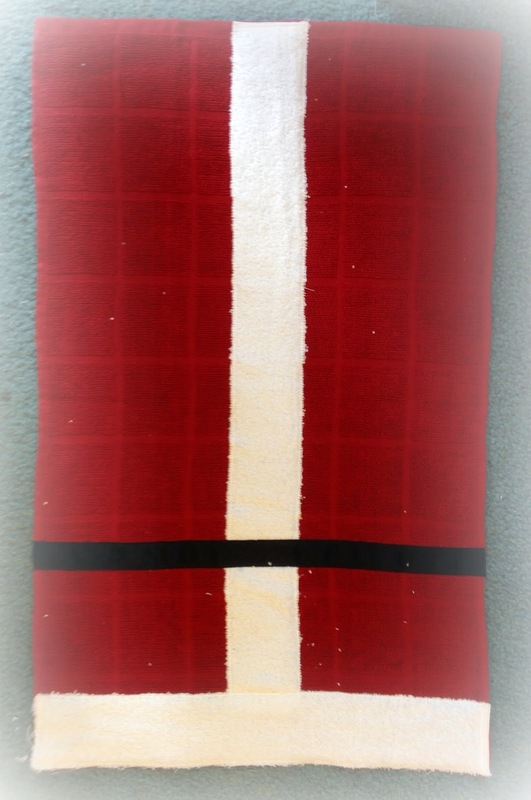 Applique to the red towel. Now cut a piece of 7/8" black gross grain ribbon the width of the towel plus 1". Turn under 1/2" on each end of the ribbon and stitch down to the towel. Again, I eyeballed it but it is about 3 1/2" above the white bottom band. I used a straight stitch to stitch it in place. 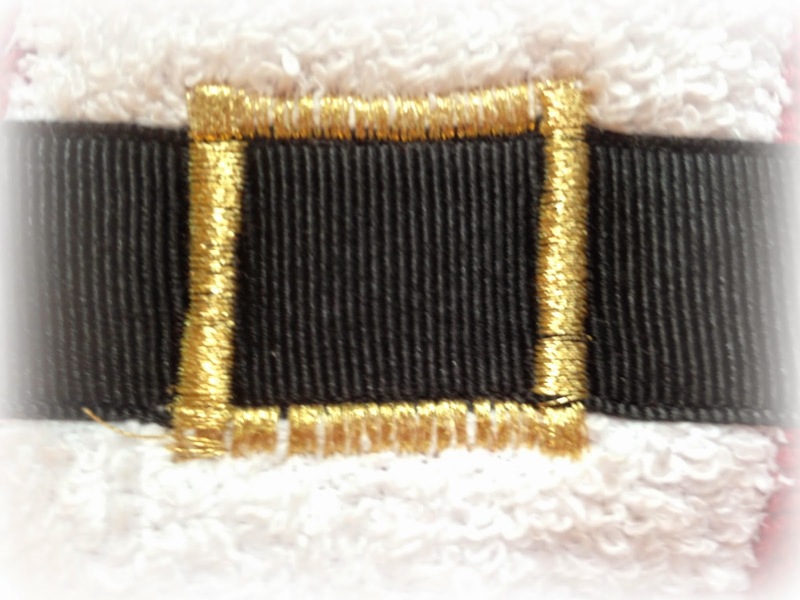 Using your metallic thread, satin stitch zigzag a belt in the center of the black ribbon. As you can see, I used the edge of the ribbon as a guide across and came in about 1/2" - 3/4" from the edge of the white band. It makes your buckle about 1 1/4" square. I didn't mark anything, I just eyeballed it and started stitching. Ta Da! 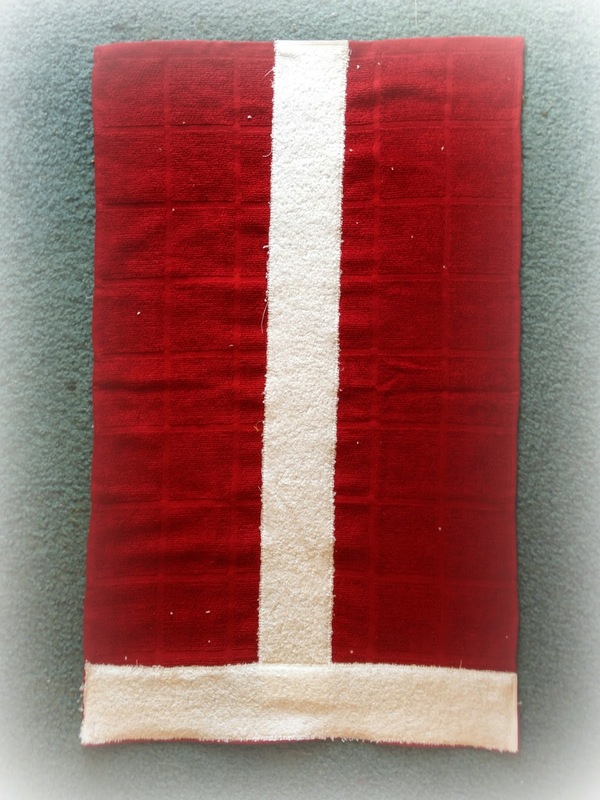 A Santa Belly Hand Towel! The thing I love about these towels is that they are all washable and you don't have to worry about messing the towel up. When I was looking for the post from the Twas The Night, I realized I didn't post a picture of all the Santa Belly things I made. They are so easy! 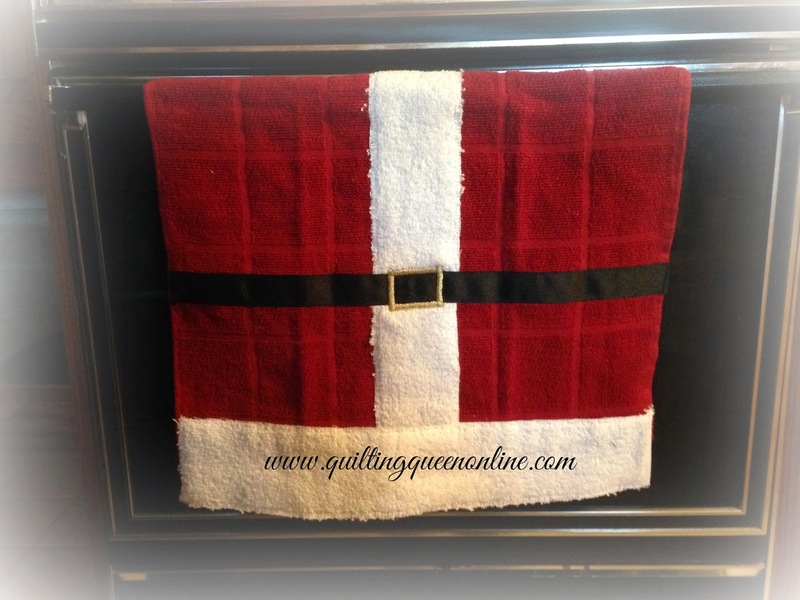 You can do them on just about anything; placemats, pot holders, wine cozy's.... the projects are endless. 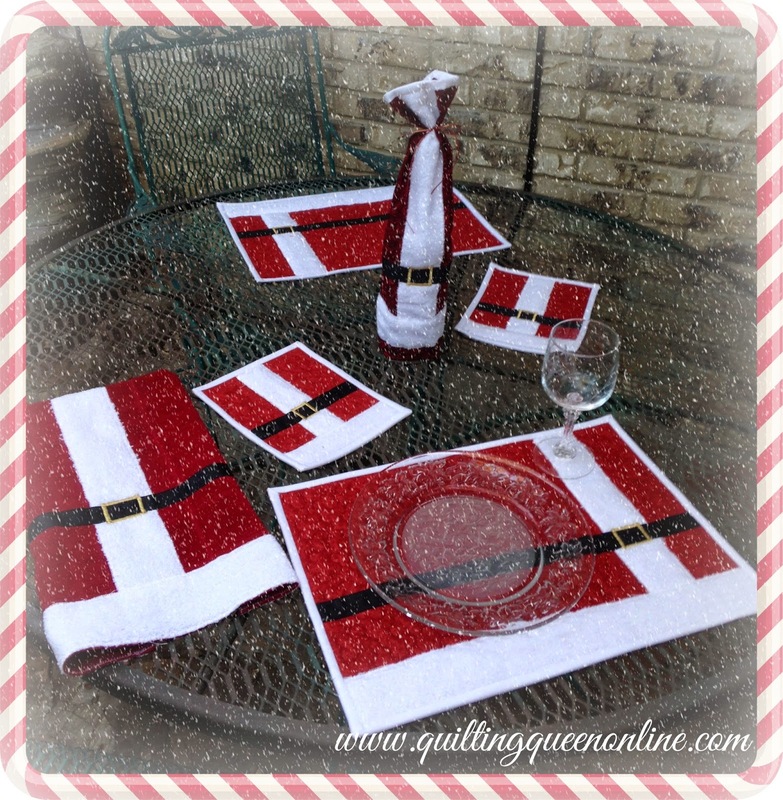 My next project is an apron but not sure that will happen this Christmas!